The part-by-part study of the screenless music player determines that Apple is keeping the price of the iPod shuffle at $79 because the price of NAND flash memory has fallen quickly enough that 4GB of storage is slightly less expensive now than 1GB was in 2007, the last time iSuppli examined the second-generation model. A 4GB chip is estimated to cost exactly $6 where 1GB would have required Apple pay $6.98 nearly two years ago. As a result of this and other fluctuations in component prices, a standard version of the shuffle costs virtually the same to make as it did in the past: the pure manufacturing and part costs of the 2009 update are $21.77, or just three cents lower than what was needed in 2007. The stability of the price comes even as Apple has complicated the interface by adding voiced song titles and an audio menu system for choosing from playlists. iSuppli believes the balance was achieved by having a purity of purpose, where virtually every minor part is ultimately just a slave to the media processor or the flash memory. "Apple has managed to take the lowest end of the iPod line and actually further downsize it, while adding features to what had been a virtually featureless device," the research firm's teardown director Andrew Rassweiler says. "Beyond the memory and controller, all the other components basically provide power, interface and interconnect functions for the memory and media-player chips." 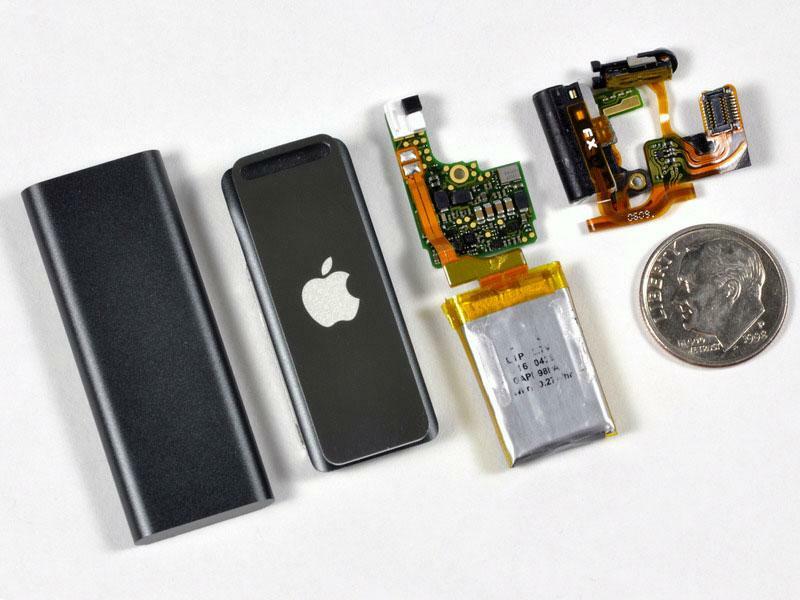 iFixit's dissection of the third-generation iPod shuffle. Of the parts in the iPod, Samsung has the greatest influence over the price as it's responsible for both the processor and the storage. These combined represent about $11.98, or 55 percent of the total price after assembly is included. iSuppli is quick to head off accusations that Apple is charging a roughly 200 percent profit margin, noting that the $21.77 manufacturing price doesn't account for licensing, marketing, shipping, and other efforts needed to actually bring the iPod shuffle to a store. It also doesn't reflect expenses at Apple as a whole. Nonetheless, the analysts believe Apple is still building in a significant amount of headroom into the $79 price tag that may give it a more than healthy return with each unit sold, even if solely in the ratio of costs rather than the actual money. "At a retail price of $79, the Shuffle has to be one of the most profitable Apple products in its entire line, on a percentage basis," Rassweiler points out. iSuppli's list of costs by part for the third-generation iPod shuffle.